Eating a balanced diet is essential for your health. Proper nutrition is not about depriving yourself of the foods you love or staying unrealistically thin. If you want to enjoy good health and stay fit, adopt a diet rich in natural foods. Your daily menu should include fruits and vegetables, lean meats, fish, seafood, and whole grains. Choose nutritious foods that contain essential vitamins, antioxidants, protein, complex carbohydrates, and dietary fiber. This fruit is an excellent source of monounsaturated fat and antioxidants. Avocado has been called “the world’s most perfect food” due to its high nutritional value. It contains lutein and other carotenoids that help protect against eye disease and make your skin beautiful. If you’re trying to lose weight, avocados are a great choice. These fruits contain oleic acid and dietary fiber, which makes you feel full and slows the breakdown of carbohydrates in your body. Also known as whole grain rice, brown rice is rich in dietary fiber and complex carbohydrates. It’s one of the few foods that contain no fat. Regular consumption of brown rice helps reduce your risk of colon cancer, heart disease, diabetes, stroke, obesity, and high cholesterol. It has a low glycemic index, so it can be safely consumed by diabetics. This type of rice contains essential nutrients such as potassium, selenium, manganese, phosphorus, calcium, and vitamin D.
This North American fruit is valued for its high levels of antioxidants. Studies have shown that people who ate at least three portions of blueberries a week had a 32 percent lower risk of heart attack than those who ate this fruit once a month. 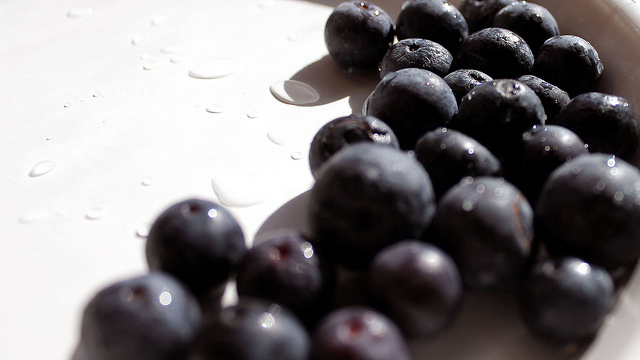 Research indicates that blueberries improve memory, decrease free radical damage, and support weight loss. For a nutritious breakfast, you can prepare blueberry juice using Blendtec blenders. Add cranberries and apples for extra flavor. Seafood is low in cholesterol and contains good fats. It has fewer calories than fish or meat. Eating seafood two or three times a week can significantly lower your risk of heart disease and stroke. Crabs, prawns, octopus, and squid are packed with vitamins and essential fatty acids that support cardiovascular health and reduce cholesterol levels. Eating broccoli a few times a week is one of the best ways to prevent mouth, throat, and stomach cancers. This vegetable boosts immunity and improves your body’s ability to fight against cancer. It also contains an unusual combination of three phytonutrients that prevent free radical damage. Researchers have found that broccoli reduces inflammation, promotes bone growth, and regulates blood sugar levels.